As soon as the 2016 election results were decided, we all had so much to say. And our first opportunity to express that those emotions was during the 2017 Women’s March. 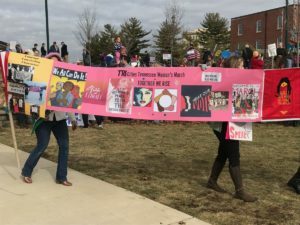 Some people went to the march in Jonesborough, some went to Washington, D.C., and some went to the marches in Asheville, Knoxville, as well as other cities in our region. And it was glorious. It was the first time in months many of us had felt hope. Not to leave out that the signs were amazing; too many to choose from to ever select a favorite. 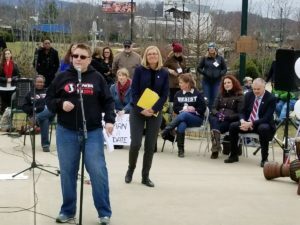 January 2018, I was humbled and awed as I stood in front of the crowd at Founders Park for the second Women’s March. So many signs and so much passion. Every single person there gave me so much hope for the 2018 Midterm Election. Now, Election Day is upon on and as we all know the stakes are high. Every day we are canvassing, phonebanking, and talking to voters to get Democrats elected up and down the ticket. We are working hard to see changes in our communities, in our state, and in our nation. Which means now, more than ever, we need to be strategic. President Trump coming to our hometown evokes every emotion we’ve felt over the past two years. I understand your anger. I feel it the same way, too. This is our home. These are our mountains. Our families are under attack. Our livelihoods, our financial security, is under attack. Every aspect of our democracy is under attack and dividing us. This isn’t who we are and yet it’s who we’ve become as a nation. If we’re going to change that we have to be strategic. We have to keep the end goal in mind. So how do we win on Election Day? Over the past two years we’ve told the nation exactly who we aren’t. We’ve told them we aren’t President Trump or his policies, that instead we are inclusive, strong, resilient, and that we are Americans, too. But we can’t only “resist” the current administration, we have to be for something. And we are for lots of things, there are many shared core values we collectively hold dear. This is how we jointly identify as Democrats. 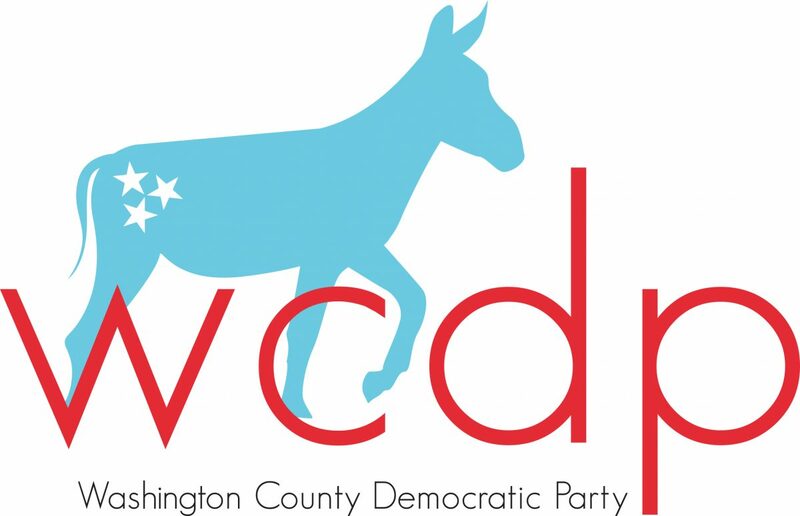 Monday, October 1, we anticipate the media coverage for the counter demonstration the Washington County Democratic Party is organizing will generate exponentially more media attention than the amazing amount of coverage we’ve already received over the past week. So I challenge you to think about the images that will be published, the videos taken. These will be images that will be shared over and over again for Democrats, Independents, and Republicans to see who live around our region and across our region. If we grab hold of this opportunity, we can harness it and use it to propel us forward in our mission and be successful on Election Day. November 6, 2018—Election Day—is weeks away and despite our anger and frustration, I urge everyone to join us in our shared mission of changing face and make up our elected leaders so we can have the government we so desperately need and want. This approach of showing everyone who we are and what we believe is strategic. All of our Democratic candidates are counting on us and our hard work to win this November. Together, we can do it. With as much energy as we made pink hats, with as much heart as we listened to and believed Dr. Ford, with as much commitment as we make to voting in every election, we must make these next 40 days before Nov. 6 full of action! Call, Canvass, Speak out!!!!!!!! !